CUSTARD. CAKE. MALTESERS. Enough said. But I'll say it again. CUSTARD. CAKE. MALTESERS. Yes, this cake is THAT good. Extremely moist with a hint of custard flavor with a honey buttercream that wonderfully complements it. And what could be better than crunchy Maltesers? (Insert your preferred choices here). This cake is a melt and mix cake. Which means, *drumroll* no mixer! Yes I am still mixer-less. I'm looking into some good mixers to buy but don't know which options to consider. Is a KitchenAid good? I've heard so much about it and seen how well it works. I'm also considering KRUPS or Kenwood. I just want a mixer whose whisks/paddle attachment reaches the bottom of the bowl to fully incorporate all the butter/sugar/whatever it is that I'm blending. What mixers are your favourite? Preheat oven to 180C. Grease a 20cm cake tin, line with baking paper. Sift flour, custard powder, and soda in large mixing bowl. Make a well in the center. Melt the butter and sugar in a small pan over low heat, stirring until the sugar is dissolved; remove from heat. Combine eggs and buttermilk in small mixing bowl. Add butter and egg mixtures to the dry ingredients. Using a wooden spoon; stir until combined; do not overbeat. Spoon mixture into prepared tin; smooth surface. Bake for 35 minutes. For the honey buttercream, beat the butter and sifted icing sugar until light and creamy. Add the honey and beat until mixture is smooth and fluffy. Spread buttercream on top of cake with an offset palette knife and arrange Maltesers around. I'm a kenwood handmixer user and looking for a standmixer as well. I read somewhere that it's a bit hard to get parts for KitchenAid here in DXB. I really like custard in cakes. This looks v good! I have soft corner for cakes that invovle custard powder as that's when thing my mom uses alot too :-) Love it! Love the sound of the honey buttercream. I use a Kenwood Chef - it's a great mixer but doesn't quite reach the bottom properly. There is a paddle attachment with flexible edges to get right to the bottom and sides - I have it on my wishlist but haven't yet tried it. As you know I received the KitchenAid Artisan Stand Mixer for Christmas and I love it! But I don't know what to do with it as I don't bake so come over and try it one day if you like. I've mostly been using it to make meatballs and dumplings. And there is an adjustable screw-thingy on it to ensure that it reaches the bottom. 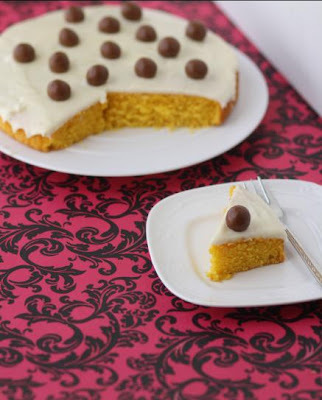 Love the idea of a custard cake and topped with honey buttercream and maltesers makes it something to dream about. I do most of my mixing by hand. I do occasionally use a Kenwood handmixer, but not very often. Mmm, this looks divine, as the other sweet recipes i´ve checked so far! And the bruschetta...yum yum!!! I have a kitchenaid and love it! Wouldn't be without it. and I feel like it's going to be with me for ever. So sturdy and strong! your cake looks really good. I like cakes with custard powder in too, nostalgia I think. I'm a KitchenAid fan too - but largely, I have to admit, because they are such things of beauty! Your custard cake looks great - I have made Nigella's Custard Birthday Cake before (from Feast) and loved it. Such a nice flavour. Thanks for popping by my blog - nice to see your blog too, I like it! Taps Sale are available in numerous options. Earlier, the kitchen faucet was considered only to receive water into the LED Taps. However, now there are abundant styles to patron based on functionality and the materials also vary from Bathroom Accessory to stainless steel. Kitchen Taps come in various combinations matching the sinks and in various sizes. It is recommended to confirm the spout size and choose goose-neck http://www.uktaps.co.uk/ so that high sink clearance is provided.